Remove Amex and Diners payment logo icons from optimized one page checkout ? How do I remove credit card logos that we don't accept? We're running "White" Blueprint theme and, since upgrading to the 1-page express checkout, there are credit card logos showing that we don't accept - Amex, Diners, Discover. 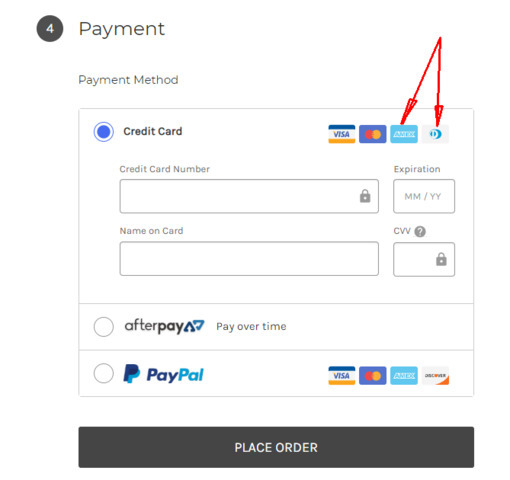 This only shows in Step 4 "Payment"
How do I remove the logos that we don't accept? Remove Amex and Diners payment logo icons from optimized one page checkout? Quick video guide to fix bigcommerce cornerstone theme logo extra top and bottom gap and logo size.